MISSOULA, Montana -- Ecologist Colin Henderson co-authored a study that may have identified the cause of the honeybee illness that has plagued U.S. bees since 2006. Henderson, 59, is an associate professor of biology at the University of Montana. He and colleagues there found a correlation between colony collapse disorder (CCD) and a lethal combination of a parasite and a virus. ALAMO — While scientists around the world try to unravel the ongoing mystery of dying honeybees, an Alamo man has vowed to do what he can on a simpler scale to save bees, one hive at a time. 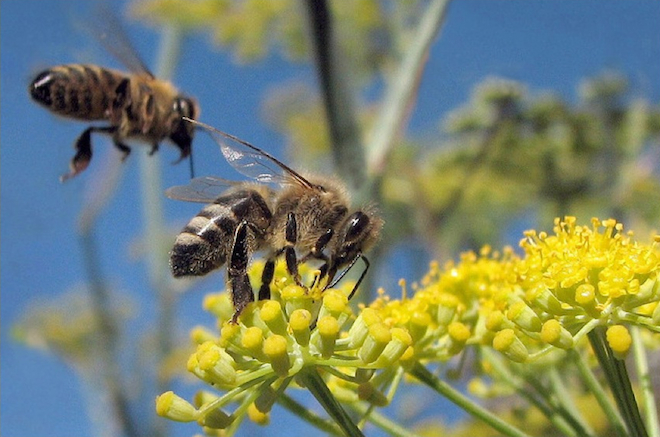 Two groups want the Environmental Protection Agency to take action to protect bees from pesticides. 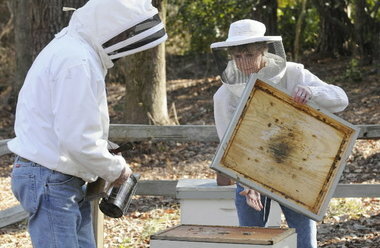 Scientists think toxic substances play a role in bee deaths. New research at UC San Diego shows at least one type of pesticide may be a factor. The old environmental rallying cry of "Save the Trees" may need to replaced with a plea to "Save the Bees!" as scientists continue to document an alarming decline in the population of insects that fill an unsung but invaluable role as natural pollinators. Ecologist Colin Henderson co-authored a study that may have identified the cause of the honeybee illness that has plagued U.S. bees since 2006. Henderson, 59, is an associate professor of biology at the University of Montana. He and colleagues there found a correlation between colony collapse disorder (CCD) and a lethal combination of a parasite and a virus. Remember the case of the leaked document showing that the EPA’s own scientists are concerned about a pesticide it approved that might harm fragile honeybee populations? Well, it turns that the EPA isn’t the only government agency whose researchers are worried about neonicotinoid pesticides. 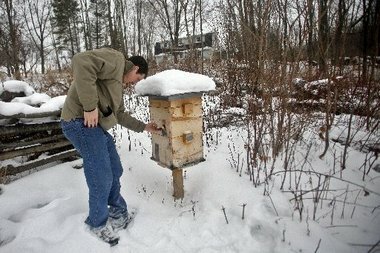 USDA researchers also have good evidence that these nicotine-derived chemicals, marketed by German agrichemical giant Bayer, could be playing a part in Colony Collapse Disorder—the mysterious massive honeybee die-offs that United States and Europe have been experiencing in recent years. So why on earth are they still in use on million of acres of American farmland? Bees are the most ubiquitous pollinators of agronomic crops, and the unexplained disappearance of these pollinators has scientists, beekeepers and farmers worried. Inside this tag is content contained within an iframe. Your browser may not display this material. You can click here to see it for yourself, and use the BACK button to return to the main page. WASHINGTON -- The U.S. Department of Agriculture has released the 2010 Colony Collapse Disorder (CCD) Progress Report highlighting current research on this still mysterious disease affecting the nation's honey bees. 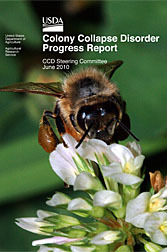 The report, which was mandated by Congress in 2008, summarizes research by federal agencies, state departments of agriculture, universities and private organizations to find the cause of CCD and how to stop or mitigate its impact. The report was produced by USDA's Agricultural Research Service (ARS) and National Institute of Food and Agriculture. Politicians debating the value or harm of Pesticides. This should be Interesting. Science Friday, Tom Seeley, Carl Flatow, May Berenbaum – Happy Holidays! Forget "The 12 Days of Christmas." It's "The 13 Bugs of Christmas." FReD can help explain how a bee sees!